Many CrossFitters struggle with gymnastics movements, so Leo Soubbotine has developed a warm-up program designed to put you on the path to muscle-ups, handstand push-ups—and beyond. The idea of a gymnastics warm-up has been stuck in my head for a long time. And because I’m a “born gymnast”—6’4” and over 200 lb.—and in love with all things gymnastics, the natural way was to figure out the details, test the program on myself and then apply it in the gym to see if it could work. To structure a gymnastics warm-up, the essential part was to keep the challenging pieces that would improve us as CrossFitters without requiring an hour to be introduced to each athlete. Based on my observations and the general strengths, weaknesses and goals of my athletes, more emphasis was put onto upper-body work and less on the lower body. Generally, most beginners desperately lack the ability to perform pull-ups and dips, while more advanced athletes aspire to perform dead-hang muscle-ups, levers, free-standing handstand push-ups and planches. Let me emphasize that this is not the end-all, be-all warm-up but rather a template containing some food for thought. Modify it based on your needs, space, equipment and athletic or coaching skills. The purpose of the warm-up is to develop basic body-weight competency for beginner athletes while improving flexibility and strength. For the more advanced athletes, the purpose is to keep them focused and excited while they master the simpler gymnastics movements and start delving into the realm of more advanced gymnastics strength. This gymnastics warm program is a very good addition to the CF trainer's arsenal. 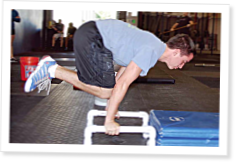 We recently got Coach Sommers' book and along with the information we learned at Tucker's gymnastics cert, we are using some of these movements to help our clients train more completely. Again a very good article, well times written by a very good coach. See you at the regionals. Great job on a long waited subject! Our body by itself is already a perfect workout apparatus. Only knowledge how to use it is required and it could be so much fun during self-exploration times... Really! I can do it! You reminded us again of well known, but forgotten principals to be more versatile athletes. Since the intro of this warm-up we've gotten several first handstands, improved freestanding handstands & kipping pull-ups and 11 people got a deadhang muscle-up. just realized that I'm posting with my wife's name. I have been waiting for something like this - fantastic. Thank you Leo! very good leo! very good indeed sir and i like your style. Thank you all for the kind words. Trying to give back to the world of CrossFit that has given me so much. Very nice, I will implement it right away. I've been looking for a way to improve my basic gymnastics abilities, and have been "dabbling" with random skills pre & post WOD. Leo, this is exactly what I needed, a specific program outline to help me achieve my goals.